4.94 points at 17 votes (rank 776). In a land and time long forgotten, there existed weird and wonderful creatures, with powers unknown to us. One such creature was Asturias, a flying, fire breathing magical dragon. Unfortunately this particular dragon has become trapped inside an old temple deep underground. To escape, Asturias must find and destroy 10 magical chests and overcome problems and obstacles blocking his path. Asturias however, is fortunate that he has four different types of magical spells with which he can detect magic, read magic, dispel illusions and restore things. Your task is to guide Asturias out of the underground caves, using his power to overcome obstructing problems. Take care though, the old temple pillars are gradually cracking and will collapse, burying Asturias, unless he uses his magical charges to continually repair them. Remember to always light the cave torches as this makes progress easier. 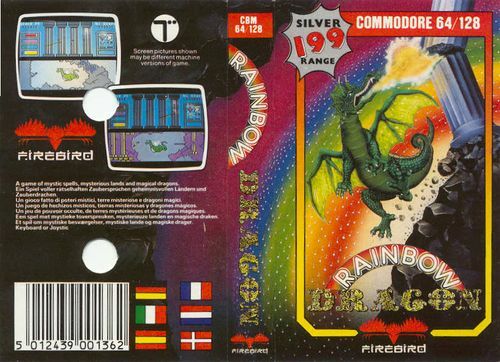 You control the Rainbow Dragon either with joystick in port 2, or over the keyboard. With the space-key you can switch between "dragon control" (lower half of the screen) and do magic (upper half of the screen). 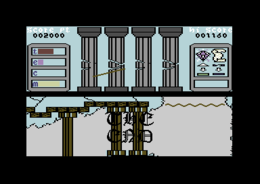 Repair pillars: For this, just move the wand to the pillar that needs to be repaired and press the fire button. Diamond - look for magic: This is used to search for magic, which is mostly located in the treasure chests. For this the dragon needs to be near the item that you want to scan. Squares and triangles (green) - destroy illusion: With this spell obstacles such as e.g. a wall, which contains of illusion magic, can be removed. When a series of problems has been solved, the dragon can pick up items which are needed for the next problem. In the middle there are four pillars which get cracks after a certain time and if one of them is damaged too much, the cave will collapse (an alarm will sound shortly before the pillar breaks). With the magic wand you can repair each pillar seperately. But beware! Each action costs one point of energy. So economize. You get points for each solved problem. First you should try to fill up the magic supply (first treasure chest). Then switch of the first energy field. For this a rotten pillar has to be found and repaired (next to the first treasure chest). Near the second energy field you should read the message ("Find the illusion below these pillars"). H.T.W: "The game is in fact quite interesting , there are hidden messages, switches, detachable energy walls, puzzles and more. 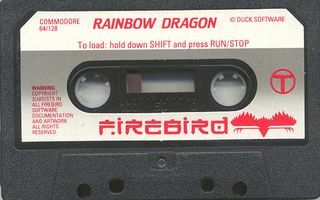 Also the graphics is appealing, clean scrolling and a well-animated dragon. However, the gameplay runs on the same paths: draw map, search for items and their use, use items....". Camailleon: "I think that it is unfortunately very difficult to find out how to raise the number of commands for the upper part. There always seem to be too few of them. Furthermore, the navigation with such a big animal in the just fitting tunnels is very obstructive, sometimes you can't really turn around. Otherwise a nice idea, the dragon and the single items are well-done." 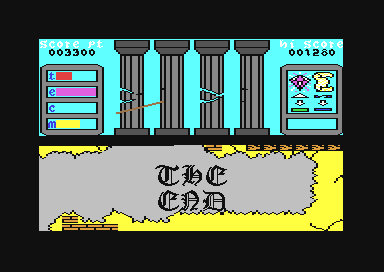 The 101% +11DX [pal/ntsc] Version by Avatar is highly recommendable, since it provides bugfixes, trainers, docs and a mysterious "extra".